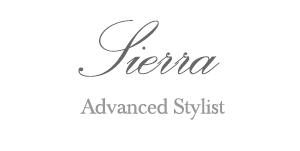 Sierra began her career in Cosmetology in 2009, earning her License in California. She subsequently obtained her Cosmetology License in Arizona, continuing to refine her experience adopting new perspectives, techniques and skills within the beauty industry. Sierra’s passion motivates her on a journey to deliver professional beauty services to each client, offering a unique experience that leaves each client glowing from the inside out. As part of her career discipline, Sierra has obtained continuous education with hair cutting techniques, color, product knowledge, makeup, waxing, and other beauty techniques and skills. In order to broaden her business acumen, Sierra is also working on obtaining a Bachelors of science in business marketing at Liberty University.